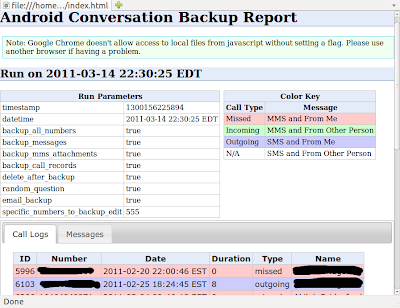 This tool can backup your SMS messages, MMS messages with included attachments, and call records, into a zip archive. 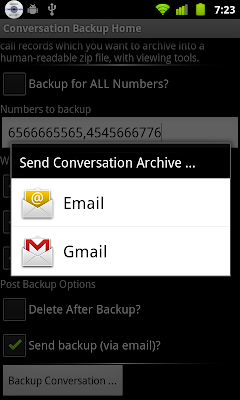 You can specify a set of numbers to limit the conversations backed up. Optionally, you can request that those archived messages and/or call logs from your device are deleted. This supports Android 2.1 and above. The zip file also includes a browser based viewer, which runs off those data files above to allow you view the files. To view the files, unzip the archive onto an empty directory and open up the index.html file in that directory within a browser. This is usually as easy as double-clicking on the index.html from a file browser. Specific Numbers Else if you specify specific numbers, then we run backup only for the numbers defined. Note that some numbers in your phone database might be the same but appear differently e.g. +44 234 510 8834 and 234 510 8834 are treated as the same number. To support this, we actually do a matching search. We recommend you put the shorter one as unique as you can, and we match for it. ie In the example above, type 2345108834 in the specific numbers to backup. Select Contacts ... This goes along with the specific numbers. It allows you select contacts from your contacts list, and it adds all the contacts numbers to the "specific numbers" list. What to Backup Self explanatory. 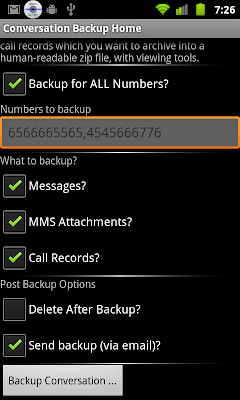 Select what you want us to backup for you, from the set of SMS Messages, MMS attachments and call records. Delete After Backup If selected, we will delete the messages we backed up from your phone datastore. This is the only option that alters your phone contents (so is inherently risky). You may choose to delete the conversations yourself. Send Backup If selected, we will prompt you to email the archive wherever you want to. Once backup processing begins, we run the backup and update you via a progress bar, and a notification on your phone. You can see updates easily from the notification bar. The backup time is relative to the amount of messages and attachments on your phone. It typically completes in a few seconds. Once completed, a prompt comes up to send/share your archive. You can usually email it, share it via bluetooth, or use any online backup app on your phone that supports it (e.g. Google Drive, etc). As a fail safe, the file is still typically on your phone at the location: Android/data/net.ugoji.android.conversationbackup/files/android_conversation_backup__DATE.zip (where DATE is in format YYYY_DD_MM__HH_MM_SS e.g. 2012_04_20__23_47_37). You can attach your phone to a computer and copy the file over, or open a file sharing program on your phone (e.g. Adao or Astro File Manager) and send it over. Extract the archive to an empty directory on your computer (using whatever application handles zip files on your computer - most computers now have native support for zip files). Open up the index.html file there in a browser. You can do this by double-clicking on the index.html from a file explorer on your computer, or use "File --> Open File" in your browser. All the files here are plain text files which you can read easily (JSON files are plain readable text files). The index.html just shows how easy it is to parse and view the contents. Can I take the archive and put the messages back on a different phone? This is a one-way archive. It does not support taking this and putting back onto your phone. Sync and archive are two different things. As an archive solution, it allows you store outside your phone information you want to save, but does not support injecting this back into your phone (or another phone). Different email providers and email clients have limits on the maximum size of attachments and may reject attachments for one reason or another. There is nothing we can do to mitigate it. This is because the email provider (e.g. hotmail, yahoomail, gmail, etc) or client cannot inform us that an email is not accepted or will not be sent through. If email does not work for you, you can use a different mode to share the file e.g. share via online storage like Google Drive, DropBox, etc. We have tested with Google Drive. Note that you will need to have the app for it installed on your phone). Connect your phone to your computer via USB, then browse your files on your phone and copy the file from Android/data/net.ugoji.android.conversationbackup/files/android_conversation_backup__DATE.zip to your computer. Find file on your phone and send it to a shared storage service as above. A File Manager app like Adao File Manager can be used.